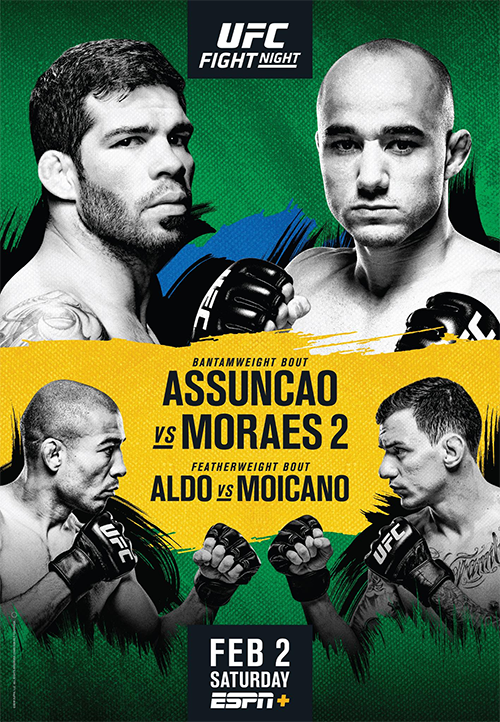 UFC Fight Night 144: Assunção vs. Moraes 2 is an upcoming mixed martial arts event produced by the Ultimate Fighting Championship that will be held on February 2, 2019 at Centro de Formação Olímpica do Nordeste in Fortaleza, Brazil. The event will be the third that the promotion has hosted in the state capital of Ceará, following UFC on Fuel TV: Nogueira vs. Werdum in June 2013, and UFC Fight Night: Belfort vs. Gastelum in March of 2017. A rematch between Raphael Assunção and former WSOF Bantamweight Champion Marlon Moraes has been slated to serve as the event headliner. The pairing previously met in June 2017 at UFC 212 with Assunção winning the fight via split decision. As a result of the cancellation of UFC 233, a middleweight bout between Markus Perez and promotional newcomer Anthony Hernandez was rescheduled for this event. A strawweight bout between Marina Rodriguez and Alexa Grasso was scheduled to take place at this event. However, it was reported on December 17 that Rodriguez pulled out of the event due to a hand injury. The pair was rescheduled to UFC on ESPN 2. Dmitry Sosnovskiy was scheduled to face Junior Albini at the event. However Sosnovskiy pulled out of the fight in early January after undergoing surgery to correct a recent injury. Albini will now face promotional newcomer Jairzinho Rozenstruik. At the weigh-ins, Frota and Bibulatov both missed the required weight for their respective fights. Frota weighed in at 123 pounds, 7 pounds over the strawweight non-title fight limit of 116. Meanwhile, Bibulatov weighed in at 127 pounds, 1 pound over the flyweight non-title fight limit of 126. Both fighters will be fined a percentage of their purses, which will go to their opponents and both bouts expected to proceed at catchweight. Great event, specially main events where exiting with impressive KO and submissions. Aldo looked like a man possessed. Awesome! Bispin as commentator? Actually really great imho! Can't wait to see/hear him with Joe Rogan. Should be fun Nothing wrong with Fitzgerald, did a great job too.